Although it doesn't begin to compare to what our veterans have done for us, once a year, the country shows its gratitude through a series of memorable traditions. In Washington D.C., a wreath is laid at the Tomb of the Unknown Soldier in Arlington Cemetery, businesses close for the day, and companies offer veterans and active duty military a small token of appreciation. This year, several corporations are showing their support by offering free or discounted service to you and your family. The following list is limited and does not include every nationwide company participating. Also, please note that a listing included here is not a guarantee your local store is participating--please call ahead to verify. Applebee's offers all servicemembers, active or retired, a free meal from a limited menu on Veterans Day. Proof of service is required. Chili's offers active-duty servicemembers and veterans a free meal from their Veterans Day menu. BJ’s offers active and retired servicemembers a free entree equal to or less than $12.95. On Veterans Day, all active, inactive, and retired military personnel at all participating Denny’s restaurants nationwide will receive a free Build Your Own Grand Slam breakfast. On November 11, those in uniform with a valid military ID or form DD214 will receive a delicious sandwich, chips, cookie, and drink at participating Honey Baked stores. On Veteran’s Day, participating IHOP Restaurants around the nation will be honoring the brave men and women who have served or are serving in the military by offering them free Red, White, and Blue pancakes. At some locations, the Red, White, and Blue pancakes will be featured as part of a free combo plate including eggs, bacon, and hashed browns. Krispy Kreme is offering a free doughnut and small coffee on Veterans Day to anyone who identifies themselves as a veteran or active duty military personnel (no ID required). Only at participating locations. One free “You Pick 2” for Veterans and Active Duty members on Veterans Day at participating Panera locations. Bring proof of service. Red Robin offer all Veterans and Active Duty Military get a free Tavern Double Burger and Bottomless Steak Fries on Veterans Day. Starbucks is offering free tall brewed coffee for veterans, active duty military, and their spouses in participating U.S. company-owned stores. Beyond those listed above, there are many other restaurants participating in free or discounted meals. For a more extensive list of participating restaurants visit Military Benefits. Amazon is offering 20% off apparel purchased online. Just use the code “20veterans” when you check out. Some exclusions may apply. During the month of November, Brides Across America is partnering with bridal salons across the nation to give away wedding dresses to qualified military brides. All military brides must pre-register online at Brides Across America. Dollar General is offering 11% off online and in store for veterans and active duty military at participating locations. While Lowe's always offers active duty servicemembers 10% off their purchase, they honor all Veterans on three specific holidays: Memorial Day, 4th of July, and Veterans Day. During these three holiday weekends, Lowe's extends the discount to all veterans who served honorably and who present a valid Form DD214 or other proof of service. JC Penney offers veterans and active duty military and their families 20% off their entire purchase in store. Some exclusions may apply. Rack Room Shoes gives military veterans and active servicemembers 10% off their purchase on not only Veterans Day, but also Memorial Day and the Fourth of July. Under Armour gives military personnel and first responders 15% off their purchase plus free shipping if purchased online. Seaworld Parks and Entertainment offers veterans and active duty military free admission or 50% off tickets if you've already used your annual free admission. The free admission applies to SeaWorld Orlando, SeaWorld San Antonio, SeaWorld San Diego, Busch Gardens Tampa, Busch Gardens Williamsburg, and Sesame Place Langhorne. It does not include Discovery Cove® in Orlando or Aquatica, SeaWorld’s Waterpark. Westgate Resorts is giving away 2,500 Three-Day/Two-Night stays at any eligible Westgate Resorts property in Orlando, Florida; River Ranch, Florida; Branson, Missouri; Gatlinburg, Tennessee; and Las Vegas, Nevada. Veterans of Operation Iraqi Freedom, Operation Enduring Freedom, and The War on Terror are offered a complimentary stay at any Westgate Resorts property, including those in Orlando and Las Vegas. 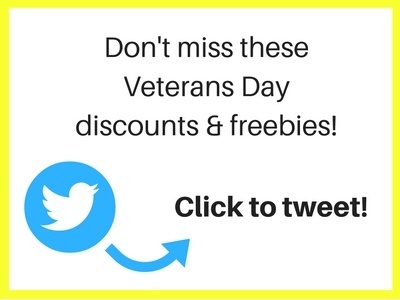 Although this list is just a handful of the companies wishing to honor you, I hope this list serves you and your family well and you are able to fully enjoy a few freebies this Veterans Day! A HUGE thank you to all of our nation’s veterans and active duty servicemembers. We appreciate you more than you know!